The GOC-in-C of Eastern Command, Lt Gen M.M. 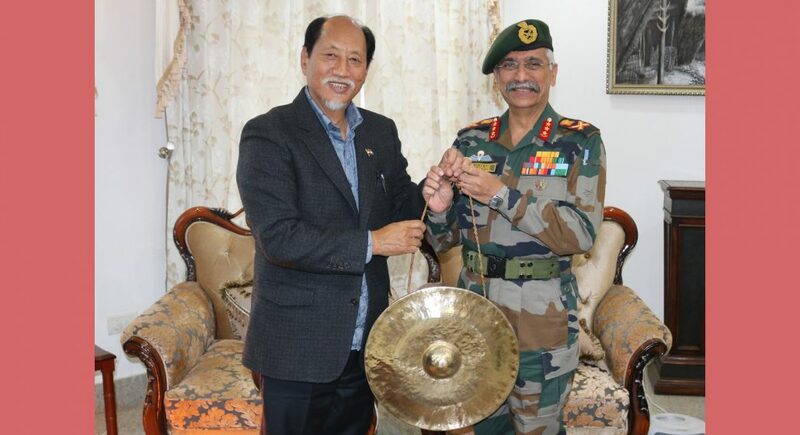 Naravane visited the headquarters of the Inspector General of Assam Rifles (North) and border locations of eastern Nagaland during his two-day visit to Nagaland from Sunday. He reviewed the security situation and interacted with troops of Assam Rifles during his visit. The Lt. General also called on Nagaland Chief Minister Neiphiu Rio on Sunday and discussed the security situation in the state, a defence release said on Monday. He along with GOC, Spear Corps, Lt Gen Rajeev Sirohi and IGAR (N) Maj Gen P.C. Nair also interacted with some prominent members of civil society organisations, students, civil administration officials, gaon burahs and ex-servicemen of the state and assured them of all possible assistance in their endeavours for peace and development. The Nagaland Chief Minister discussed several things and had shared thoughts for the common good.